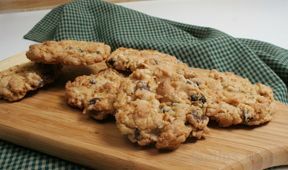 The variety of ingredients in this cookie recipe provides it with a flavor that everyone is sure to enjoy. This large recipe takes a big bowl for mixing. Cream brown sugar, sugar, and oil together. Beat in the vanilla, baking soda, and salt. Beat in eggs, one egg at a time. Add the flour and beat just until ingredients are evenly mixed. Pour this dough into a large bowl and add the oatmeal, corn flakes, raisins, chocolate chips, and coconut. Stir by hand until all ingredients are evenly mixed. 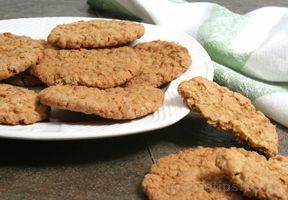 Drop rounded teaspoons of dough on to an ungreased cookie sheet. Be sure to leave sufficient space around each cookie to allow for them to spread when baking. 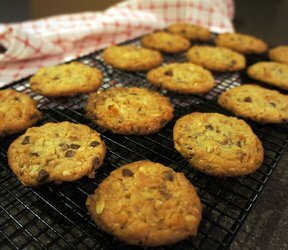 Place cookies into an oven preheated to 375° F and bake for 10 to 12 minutes. Remove from the oven and allow them to cool on a cooling rack before storing. "While I was making these I thought I had messed it up since the dough is very stiff! 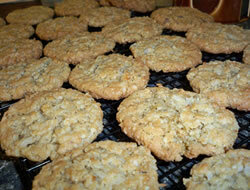 Difficult to mix the oatmeal and goodies in, but after baking they were delicious. My husband couldn't stop eating them. Definitely need a big bowl for this batch but it makes a whole bundh."